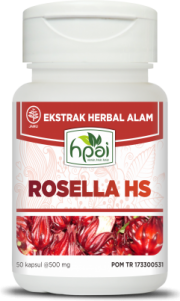 Rosella contains a variety of vitamins (A, B1, B2, B3, and C), calcium, iron, magnesium, phosphorus, potassium, and sodium are beneficial in lowering high blood pressure (hypertension), treating cancer, preventing obesity, and lowering high cholesterol. Helps maintain health and immune system. Adults: take 1 capsule 2 times daily.